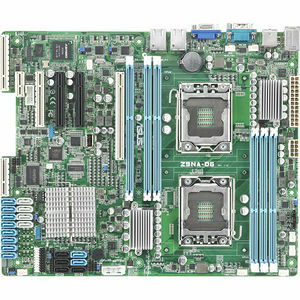 The ASUS Z9NA-D6 serverboard highly integrates various server features into an ATX compact form factor, based on dual up-to-date Intel® Xeon® E5-2400 series processors and Intel® C602-A chipset. Through innovative ASUS design, this board is able to fit into ATX case and ATX power supply. Moreover, it features enhanced storage expandability, all high-quality conductive polymer capacitors, digital power solution and high manageability via the latest ASMB6-iKVM and ASWM enterprise. All of above make it an ideal foundation for SMB general purpose host server, AP server, mail server, storage server, and even entry workstation.